"Presented by" code for "Didn't have much to do with" I bet. Nervous, scared laughter is my favourite reaction from a cinema audience. 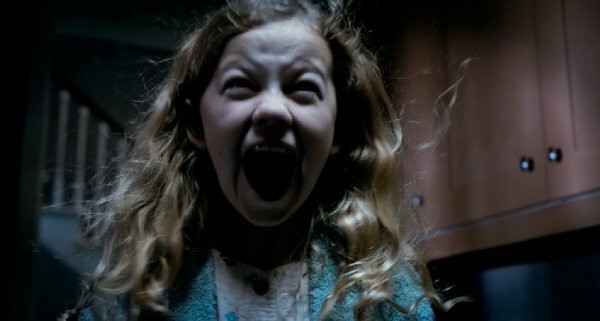 Mama, which I saw in a packed screening last night, fills the screening room with frightened yelps and relieved chuckles. It’s unashamed in using classic scare techniques. So for example, when someone is nervously wandering around a remote, abandoned cabin at night and their torch starts flickering you know their goose is not only cooked, but more or less how it’s going to be served. And, as the poor victim staggers around in the dark with weird swooshing evil sounds moving around him, you start to giggle in anticipation of the big shock that’s about to come. 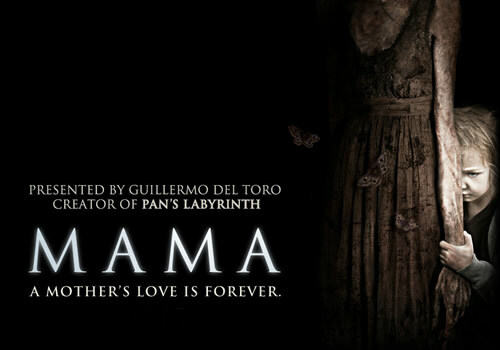 Don’t get me wrong, Mama isn’t groundbreaking or even particularly memorable, but it is an scary and well constructed horror film. The premise is solid; Lucas (Nikolaj Coster-Waldau) and Annabel (Jessica Chastain) are a cool young couple. He’s an artist of some kind, and she’s the bass player in a punk band. Five years ago Lucas’ twin brother Jeffrey snapped, killing his wife and running away with their two young children, 3 year old Victoria, and 1 year old Lilly. They were never seen again. Lucas has been searching for them ever since, and has almost given up hope when his team find a cabin out in the woods with signs of life.. Miraculously the children have survived five years in the wilderness, regressing to a feral state, running on all fours and snarling viciously. Their childish drawings on the walls of the cabin and the hospital show them being protected by a sinister looking figure they call ‘Mama’. Lucas and Annabel adopt the children, moving into a big, shadowy house to reacclimatise them to society... but has something followed them from the woods? Much of what makes Mama work is when it sticks to the principle that your imagination is much more horrifying than whatever a 3D graphics package can produce. There are some incredibly spooky scenes where we realise with a chill that something horrible must be just out of shot. Your mind races trying to fill in the blanks. The environment helps a lot, our characters being transplanted from their hipstery cluttered flat into an austere and dark detached house, the previous tenant apparently having been a big fan of very low watt lightbulbs. This environment is so obviously spooky that, in a perverse way it all seems oddly familiar. Andres Muschietti isn’t showing off a huge deal of originality in the imagery he uses here, but it’s impressive how well he’s managed to synthesise many different nods to classic horror into a coherent whole. The dolls composed of twigs and leaves the children play with might have fallen out of The Blair Witch Project. The monster moves like Giger’s Alien. The black rotting stains on the walls recall Polanski’s Repulsion. The themes of loss, revenge and corrupted maternity ring through Japanese horror like Shimizu’s Ju-on series or Nakata’s Ring. That's not to say that Muschietti doesn’t have his own moments of directorial brilliance. There’s an absolutely brilliant dream sequence midway through the film that seamlessly fills in much of the backstory. Shot from a first person perspective it’s interestingly digitally textured and coupled with the framerate being overcranked it gives us an intensely claustrophobic sequence that left me holding my breath with tension. Other highlights are a Sam Raimi style active camera, walking us into places we don't want the characters or ourselves to go. The classic example being a character being scared to open a door, they reach for it and begin to open it, and then we cut to a shot from inside the room. It's in Mama, it's in Evil Dead II and probably a thousand other shockers. This puts us in the action as much as the characters, with the monster popping up to scare us as much as the characters in the film. The monster itself is also well worth the price of admission, although predictably, the more you see of it, the less interesting and scary it is. 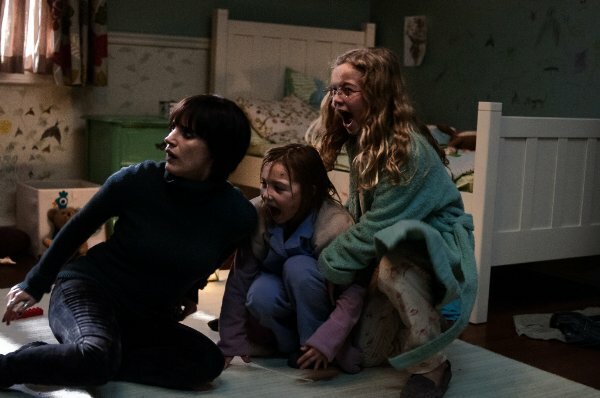 Muschietti pulls an incredibly smart trick in letting us repeatedly see the children’s crude pictures of Mama. You’re never able to quite get a handle on her but you know she’s spindly, black and tall, with long clutching arms. You sense the influence of producer Guillermo Del Toro in her movement. She moves like she's broken some pretty important bones in her body. As she comes for our heroes she flops and staggers awkwardly, but suddenly it’s as if she finds a rhythm and can move terrifyingly fast (usually right at the camera accompanied by a sudden violin sting). She’s obviously fantastical, but Mama makes a strange physical sense - you might not understand what she is, but you get an idea of how she works. It gives fantasy a slightly indefinable realism and plausibility, reminding me of the Faun or the Pale Man from Del Toro’s Pan’s Labyrinth. To add a pleasant bit of complexity, this is a maternal monster motivated by love and loss rather than pure hatred and evil, which muddies the waters a bit, the film encouraging us to sympathise with the darkness lurking in the shadows. AHHHH.... oh. Uh cool t-shirt. Jessica Chastain isn’t exactly stretched here, but she gives the film a decent dramatic weight as she inadvertently becomes a mother figure herself. Also, on a purely superficial level, she looks great in thick eyeliner, a black bob haircut and tattoos Nikolaj Coster-Waldau (of Game of Thrones fame) is good enough, but has slightly less to do and spends most of the film incapacitated. The two young girls, Megan Carpenter and Isabelle Nélisse, are both excellent, especially Nelisse as the more feral of the two. When she scuttles around on all fours it’s genuinely freaky to watch. Mama is a competently and professionally put together film that’s been put together by a director who clearly knows his way around the horror genre. The CG infused ending sequence is a bit crap, and perhaps too many people end up wandering around the woods at night with a malfunctioning torch, but on the whole Mama is a nicely thrilling piece of unpretentious horror cinema.